Oscar-winning actress Jodie Foster has sold her Hollywood Hills Spanish-style home, but it wasn’t easy. The Wall Street Journal first reported the sale, for about $5 million. In some locations, $300,000 is more than two times the median home value. Homes in cities with lower median home values often offer more bang for your buck. We scoured through the depths of our home listing database to find the best homes $300,000 can buy — all located in recognizable cities across the country. Mortgage rates for 30-year fixed mortgages fell this week, with the current rate borrowers were quoted on Zillow Mortgages at 3.96 percent, down from 4.08 percent at this same time last week. The 30-year fixed mortgage rate spiked to 4.30 percent on Wednesday, then hovered around 4.06 percent for most of the week before falling to the current rate. When homeowner Lauren Kelp and her husband moved to Phoenix, she decided to pull inspiration for her living room design from her new desert surroundings. 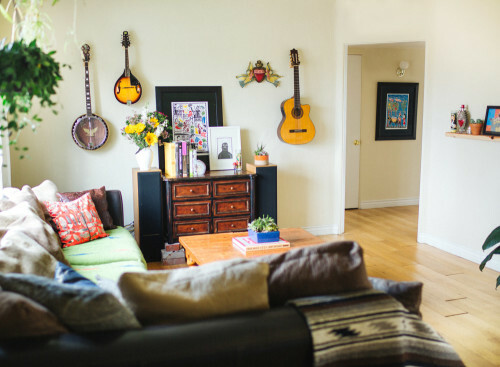 The space is filled with Southwestern, eclectic elements. Source: Lauren Kelp.